Q-switch, IPL and Refractional lasers. We use Class 4 Medical Devices. We offer advanced non-invasive, cosmetic technology for skin rejuvenation and removal of imperfections caused by age, the sun, scars and genetics. Most of our devices, and all of our lasers are classified as Class 4 medical devices. You will not find this equipment in salons or spas. We research and test equipment – sometimes for years – prior to offering it to our patients. We want to make sure that the technology meet our expectations, and that patients will be satisfied with the results. None of our staff is commissioned and our priority is making sure you are treated effectively and safely. We require a complimentary consultation prior to recommending any type of laser treatment. When prescribing a skin health plan, we may recommend a combination of treatments to effectively achieve your results. We often begin with a Visia skin analysis which maps your skin, compares it nationally against your gender and age group, and allows us and you, to see the results and effectiveness of our advanced skin services. Once in a while, there is a breakthrough technology in our industry that causes our jaws to drop in awe! We are so excited to introduce our new laser from the leading medical laser technology company, Cynosure (Palomar). 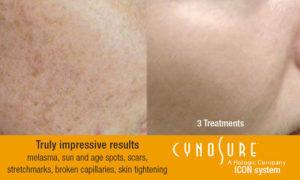 If you have tried IPL (photofacial) or treated broken capillaries in the past, and have been disappointed, we invite you to try our new laser, Cynosure. It handles sun and age spots and melasma like magic, targets unsightly veins around nose and cheeks, resurfaces skin and promotes new healthy skin. Please come in for a complimentary skin consultation, especially if you suffer from rosacea, melasma, hyperpigmentation, telengiectasia, acne scarring. This laser is simply amazing. We use it with a carbon-based lotion for our Carbon Laser Facial, (Spectra Peel) which is highly effective for treating enlargened pores, blackheads, sun damage, uneven skin tone, and its non-ablative resurfacing stimulates new cell growth. Results are visible after only one treatment. Watch The Doctors episode reviewing the Spectra Peel. Additionally, we treat chronic melasma with our Spectra laser. Melasma is the discoloration or brown patching of skin that commonly appears on forehead and cheeks. It can be worsened by sun exposure, pregnancy, hormones, birth control pills. Traditionally, dermatologists have treated with topical creams including: hydroquinone (HQ), azelaic acid, kojic acid, retinoids, topical steroids, glycolic acid, mequinol, and arbutin. However, long-term usage can create depigmentation of the skin. The Spectra laser is especially effective because of its precision and multi-wave length capability, which also allows patients with darker skin to be treated safely with laser. We’ve been highly successful with Spectra treating melasma. Our fractional resurfacing laser (Fraxel) gives skin resurfacing results without the downtime associated with traditional ablative procedures. The fractional resurfacing laser rejuvenates and tightens skin, especially along the jaw line, and effectively treats fine lines. Resurfacing promotes the regrowth and renewal of healthy skin by removing targeted, dead upper dermal layers, and promoting new cell growth. New skin contains collagen and elastin, reducing the appearance of wrinkles and fine lines. Watch a brief, unscripted patient video talking about fractional resurfacing. Photofacials utilize Pulsed Light Technology, which is similar to laser technology. Lasers use a continuous light wavelength, Pulsed Light uses multiple wavelengths which, when directed onto the skin, concentrate their energy at different levels, absorbed by the melanin in the skin. Pulsed light targets sun and age spots, and helps to encourage collagen production. We do not use IPL for laser hair removal as we believe this technology is not best suited for this purpose. This procedure is effective for treating birthmarks, freckles, rosacea, and sun damage. You will see visible results once the treatment is complete, and its positive effects are long-lasting. While skin is cleared, it also appears more even toned and youthful. Our IPL has been highly effective in treating chronic rosacea. This painful, persistent condition causes imflamed red patches to appear on the face. It can be triggered by a multitude of causes. We may prescribe gentle peels in conjunction with pulsed light. Click here to see a brief, unscripted video of a patient who has been successfully treated for melasma. Vein Gogh offers a simple solution for the treatment of small facial veins and broken capillaries (telangiectasia) using Microburst Technology, which is a fixed amplitude, high frequency energy delivered to a very targeted location. This is delivered into the unwanted blood vessel via a hair-thin probe. The walls of the vessel collapse as the energy instantly heats the trapped blood, allowing it to disperse safely, without damage to the surrounding tissue. Results are immediate and usually only one treatment is required. It is important to note that some people are prone to broken capillaries, especially along the sides of the nose and across the cheeks. Once the vessel has been treated, it is permanent. The return of a broken capillary is not the same vessel. Vein Gogh is painless, effective for a range of fine vessels and cost-effective. Click here to see Vein Gogh in action on The Doctors.